Looking for substrate can be tricky: hobbyist live by their substrate and everyone claims to be the best. Lucky for you, this guide makes it easy for you to make the best decision for your set up. How Much Sand do you Need for a Reef Tank? Reef substrate has a number of functions in your aquarium. Let’s take a look at the most important roles it plays. Whatever reef substrate you choose, it’s going to have a big impact on the overall look and feel of your aquarium. Reef substrates are available in a variety of colors and grain sizes, which can either be a visually attractive part of your aquarium or can hide at the bottom of the tank and blend into the overall aesthetic. In any case, part of the appeal of having an aquarium is making it look as good as it can – and the substrate at the bottom of the tank is an important component of that. Even non-living reef media quickly become alive as helpful bacteria colonize the substrate at the bottom of the tank. Helpful bacteria need a firm surface to grab onto and colonize, and reef substrate provides just such a surface. Once colonized, these bacteria can play a role in decomposing uneaten food waste and fish waste that falls to the bottom of the tank. In the process, these bacteria play an important role in maintaining the water chemistry in your aquarium. Reef substrate can also form a soft substrate that burrowing and sand-sifting critters living in your aquarium can get themselves into. Many sand-sifting creatures use the bottom media as a source of food, picking through it to find deposited bits of uneaten food and other nutrients. At the same time, burrowing creatures like crabs and some fish need the substrate to feel protected – otherwise, they may become stressed in your aquarium environment. If you have a sand bed that is six inches or deeper, you can actually facilitate denitrification – the removal of nitrogen from the water – in your aquarium. This happens because in a deep sand bed, oxygen can’t penetrate all the way to the base of the substrate. When there’s no oxygen, bacteria are able to convert nitrate to nitrogen gas so that it is lost from the water and can’t be used by algae to grow. There are a lot of things to think about when choosing a substrate. Let’s talk about the most important factors and how they can work with the creatures you have living in your tank. One of the main advantages to having sand at the bottom of your aquarium is that it serves as a home for beneficial bacteria that help regulate the water chemistry. But, dry sand doesn’t have any bacteria in it when you receive it. It takes time – up to several weeks – to cultivate bacteria in your sand by cycling the tank. If you simply can’t wait to get your aquarium up, running, and filled with creatures, live sand is an option. Live sand is already cycled so that it is colonized by helpful bacteria, and is shipped wet so that those bacteria remain functional when they get to your aquarium. Having this initial colony of bacteria can dramatically speed up the process of regulating the water chemistry in your tank, but live sand is also very expensive compared to dry sand. Grain size and flow are always at odds in an aquarium, which can create compromises for aquarists. Higher flow across the bottom of your tank is typically a good thing because it helps keep detritus from building up, which can be both unseemly and bad for water chemistry. However, media with small grain sizes – like sands – don’t handle high water flow rates very well. While that might push you towards a higher grain size, there are also drawbacks as the grain size increases. Larger grains provide larger spaces between each grain, so that the media provides less protection and habitat for burrowing creatures. In addition, the large pore spaces can actually allow detritus to build up in any areas where the water flow is not as strong. How Much Maintenance are You Willing to Take on? Sand beds can either be a huge amount of maintenance work or almost none at all depending on what type of bed you have and how you want to manage your tank. It’s important to recognize that sand beds are living beds thanks to the helpful bacteria that they contain. So, if you want to take on the task of using a suction-based sand cleaner to keep your sand clean, it’s important to do your entire bed routinely from the moment you set up your tank or else work in small patches. Otherwise, you risk losing the helpful bacteria and the health of your entire tank with them. On the other hand, larger grain size media will be easier to clean without causing as much of a disturbance simply because most of the debris you will be cleaning is located in large pore spaces and is easier to access. You can also opt to do very little maintenance and leave it to the bacteria and critters in your tank – like sea cucumbers, snails, and gobies – to clean up debris for you. While this may leave the bottom of your tank looking dirtier, it is an effective way to manage the water chemistry. What Creatures are in Your Aquarium? The types of creatures that are living in your aquarium should have a big impact on what type of substrate you need. 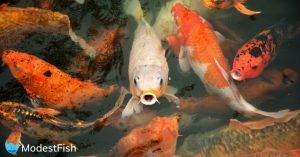 For example, if you have types of fish that pick at the substrate for a quick snack, you’ll want a fine-grained, soft substrate. That increases the surface area for catching detritus for the fish to snack on, while also ensuring that their skin won’t get cut up and potentially infected as it might with coarse-grained media like coral skeleton. 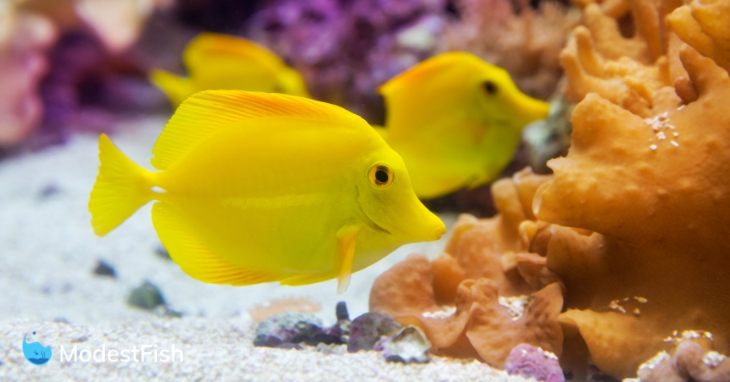 The types of creatures in your aquarium can also affect how much maintenance you need to do. If you have critters like snails, gobies, and sea cucumbers that continuously consume debris off the media, then you may not need to constantly clean the media and can opt for a fine-grained substrate like sand. Finally, consider whether any of the creatures in your tank are burrowers. These critters will prefer fine-grained substrate, since it offers more area to hide than large-grained substrate with gaping pore spaces. Remember that aesthetics is also a major part of your substrate choice. 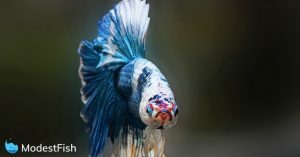 Even when you’ve satisfied the needs of all the creatures in your aquarium, you’ll still be left with choices for colors and styles of bed that will affect the overall look of your aquarium. The depth of your sand bed is an important consideration when setting up a reef tank and you don’t want to get more or less sand than you need. So how do you figure out what the right amount is? To figure out exactly how much sand you need in your tank, you need to know the depth of the sand bed you’re aiming to create and the dimensions of the bottom of the tank. But, there’s an easier way to get an approximation using just the tank’s volume. The volume of your tank in gallons is roughly equivalent to the amount of sand in pounds that it takes to make a one-inch bed. So, if you have a 10-gallon tank, 10 pounds of dry sand is enough for a one-inch bed. There’s a lot of debate in the aquarist community over whether a shallow bed – between ¼” and 2” – or a deep bed – between 3 ½” and 6” or greater – is better. Shallow sand beds remain oxygenated throughout, so in order to avoid nitrogen build-up that could alter your tank’s water chemistry you’ll need to clean the bed roughly once per month with a siphon. On the other hand, deep beds do not have oxygen at the bottom of the bed, allowing bacteria to facilitate denitrification so that the nitrogen balance in the tank auto-corrects itself. Deep beds thus require little to no maintenance, and can actually be harmed by intensive cleaning. In general, avoid sand beds between 2” and 3 ½” – beds of this depth allow toxic chemicals like hydrogen sulfide to build up and flow back into the tank water, which can be quite unhealthy for your aquarium. Now that you know more about how to choose and set up a bed in your reef tank, let’s take a look at the six best substrate options for saltwater reef tanks. This live sand mix from CaribSea is designed to get your reef tank up and running quickly thanks to its pre-established colonies of helpful bacteria. The substrate itself is made of aragonite, which has a relatively small grain size and is biologically inert in saltwater tanks. The grain size is similar to the fine sand you might find at the beach and is ideal for reef tanks with burrowing creatures or fish like gobies that prefer to pick detritus off of the tank bottom. While the substrate is called pink sand, there are relatively few pink grains in the mix and it is instead a has an aesthetically pleasing white sand appearance. There are also a variety of other styles available from CaribSea to achieve a unique look for your aquarium tank. This crushed coral blend from CaribSea is designed for tanks where a substrate with a large grain size is preferred. The blend is specifically intended for tanks with high flow through the bed, such as tanks with under gravel filtration systems or reverse flow beds. The grain size in the mix is variable, from just 20 mm to more than 550 mm. Because there are crushed oyster shells and crushed corals in the substrate, it is not suitable for tanks with burrowing or sand-sifting creatures – sifting fish in particular are susceptible to being cut up by this media. However, it works extremely well for cichlid tanks. This dry aragonite reef sand is an excellent compromise between very fine sand media that is easy for sifting fish to work with and larger-grain media that is better for preventing detritus build-up. The substrate grains are between one and two mm in size, although there is also a healthy does of silt mixed into the larger grains. It can be cleaned easily with a standard gravel cleaner without causing clogs in the line. Another advantage to this media is that it can be used standalone for cichlid and similar tanks, but can also be combined with a finer sand substrate to provide extra construction materials for burrowing creatures. The substrate is made entirely from aragonite, which has the added benefit of buffering the pH in your tank to keep it stable. Although there is only one style available, the sand is aesthetically pleasing for a wide variety of aquarium styles. This specialized dry sand is designed specifically for deep sand beds where both nitrate reduction and denitrification are being mediated by the bacteria in the bed. The sand is relatively fine, with a grain size between 1.25 and 1.95 mm, and is not designed to be disturbed by cleaning. The small size is ideal for burrowing critters or for fish sifting through the sand for a quick snack on detritus. However, the sand particles are just large enough that they will not easily float around in the tank and cause cloudiness if they are disturbed by your tank’s filter or sifting fish. The sand is made of 100% aragonite so it provides excellent pH buffering as well as contributes necessary trace elements into your aquarium’s water. Note that this specialized sand is only available in a single style. 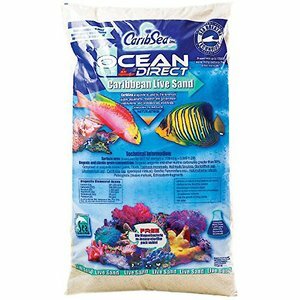 This live sand mixture from CaribSea is designed to jump-start your aquarium’s cycling and prevent ammonia levels from spiking by delivering a highly concentrated mixture of beneficial bacteria. The substrate itself is extremely fine – finer than the sand found at most beaches – so it can take several days for the tank to clear up after adding this media. Even then, this sand may be too fine for aquariums with burrowing or sifting fish as any sand that is blown into the water column will not resettle for days afterward. For the same reason, this sand can be quite difficult to clean and is ideal for tanks with deep sand beds that do not need much maintenance. The small grain sizes also reduce flow through the tank, so there is less chance of deep layers within the bed being accidentally oxygenated once the bed is established. This sand is only available in a single style and has a very light tan coloration. 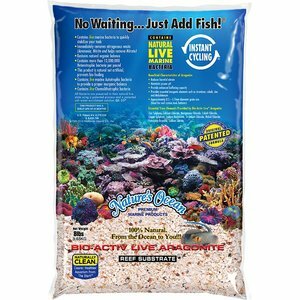 This live sand mixture from Nature’s Ocean is designed to immediately help get spiking ammonium and nitrate levels under control in your tank to help a tank that is in trouble or rapidly establish a new tank. Note that because of the potency of this mixture, it is recommended to introduce this substrate in small quantities to an already existing tank. While the grain size of this sand is advertised as between 1 and 2.5 mm, note that much of the substrate is actually 1 mm in diameter or less. There is a large volume of silt that comes with the sand, which can be helpful in tanks where an especially fine-grained substrate is needed. The ultra-fine grain size also helps with the buffering capacity of this sand mixture, which is made entirely from aragonite. This substrate is only available in a single style and has a chalky white coloration. The best reef sand ultimately comes down to your specific aquarium and the needs of your fish. Live reef sands like the CaribSea Ocean Direct, Nature’s Ocean Bio-Active sand, and the CaribSea Arag-Alive sand are ideal for setting up a tank quickly or having an emergency intervention to reduce increasing ammonia levels in an existing tank. All three of these sands are also very fine-grained, which is best for tanks with burrowing or sand-sifting creatures. If you want to set up a tank with a deep sand bed, consider a substrate like the CaribSea Dry Aragonite Special Grade sand that is specifically designed to promote nitrate reduction and denitrification. Finally, if you have a tank hosting cichlids or other fish that need a coarse substrate with high flow rates, consider sand like the CaribSea ACS00050 Aragonite Reef Sand that offers large grain sizes. Adding sand to your aquarium is a big job, but thankfully you only have to do it once in a while. To start, you need to rinse out your new sand to get any impurities and silt out. You can rinse it out in a bucket, allowing water to overflow and wash away the cloudiness with it. Once that’s done, transfer your fish to a secondary tank and remove the water and whatever substrate you currently have in your tank. Spread the new sand across the bottom, refill the tank’s water and use a dechlorinating agent to condition the tank. If you are using live sand, your new tank will be ready to house your fish again – otherwise, you will need to wait a few weeks for the tank to cycle and the sand to establish bacteria. How Can I Mix Sand if I Want to? It’s also possible to mix your own sand for aesthetic purposes or to get the benefits of both coarse and fine-grained sands. There are a couple rules of thumb to follow when mixing your own sand, though. First, keep in mind that finer grains will tend to settle to the bottom of the tank over time. To avoid unwanted settling, simply put a bed of fine-grained sand on the bottom of the tank and then layer coarser sand over top of it. Second, remember to distinguish between dry and live sand. Mixing dry and live sand is fine and will help kickstart nitrogen cycling in your tank, but the effect will not be as pronounces as if you were to mix multiple types of live sand.